The Palestinians and the international community say they have agreed "practical steps" to create a viable Palestinian state. An agreement reached at a London summit covers governance, security, and economic and social development. US Secretary of State Condoleezza Rice, attending the summit, said prospects for peace between Israel and Palestinians were the best in years. The conference aimed to show world support for the Palestinian Authority. Ms Rice said the recent elections in Iraq and the Palestinian territories, and moves to broaden political participation in Egypt and Saudi Arabia spelled momentous times for the region. "We are trying to lay a foundation for a successful movement through the road map to a two-state solution," she said. Earlier, she urged Israelis to avoid taking actions that could harm the fragile peace process, and praised Israel's "historic step" to disengage from the Gaza Strip and parts of the West Bank later this year. She also called on Arab countries to crack down on militant groups that target Israel. Palestinian leader Mahmoud Abbas said the Palestinians were committed to the peace process, and were doing everything they could to preserve a truce with Israel. 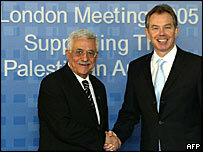 UK Prime Minister Tony Blair - who hosted the one-day conference - said the accord was not only for the sake of the Palestinians, but also the wider world. Mr Blair said the EU would assist with the establishment of the new Palestinian political institutions, the US would set up a security-co-ordinating group and the World Bank would focus on economic development. A US general appointed by the White House, Lt Gen William Ward, "will soon relocate to the region" to lead security efforts, Ms Rice said. An end-of-summit communique sets out the measures the PA says it will take to reform itself. The 17-page document refers to the goal of a sovereign, democratic and territorially-contiguous Palestinian state - existing side by side with Israel. The Israelis are called on to dismantle the system of restrictions hampering economic activity, and the Palestinians are to carry out reforms, including the consolidation of the security and intelligence services. The communique states that "while participants noted that the situation on the ground remains fragile, they underlined the importance of working to establish a virtuous circle and the renewal of progress towards peace through the full implementation of the roadmap". Israel did not attend the meeting, but was said to be watching closely. Prime Minister Ariel Sharon's office said: "Israel stresses it will be impossible to move the political process forward in keeping with the roadmap as long as the Palestinian Authority does not firmly fight terrorism or dismantle terrorist organisations." Participants to the 23-nation conference also include United Nations Secretary General Kofi Annan and representatives from five other international institutions. He said he saw a moment of "promise and potential" in the Middle East and urged "key players keep their eyes on the ultimate prize of a lasting peace". Mr Abbas, Mr Blair and Ms Rice condemned last week's suicide bombing in Tel Aviv which killed five people. It was the first of its kind since Mr Abbas took office in January. 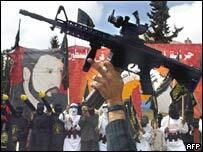 It is not clear who was behind the suicide bombing, but Israel has said it holds Syria responsible. Syria denies involvement.